Tonight weeWONDERBOX welcomes Stephen Taberner, for a unique musical evening of delight. 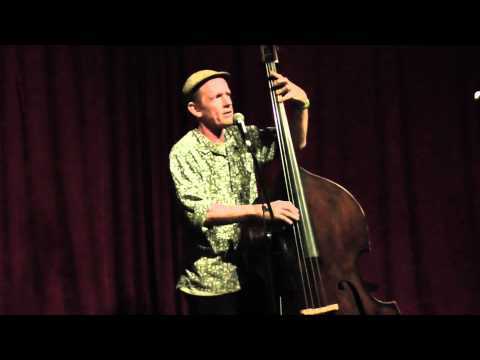 Stephen, better known as the whimsical mastermind behind the Spooky Men’s Chorale, has had a long and loyal relationship with his beloved double bass Beatrice. Over the years he’s assembled a ramshackle platoon of songs, some wistful, some achingly beautiful, some dead down dirty, and some just downright ridiculous … and has the audacity to sing them live in a mesmerising wrestle to the musical death with the formidable Beatrice (and an impossibly piquant ukelele called piglet). Tonight will also allow Stephen to transform the audience into an instant choir for the purpose of adding delightful multilayered harmonies to songs that demand them. Cost: £10 (or less if you’re poor) on the door; or see below under Venue information (note: please enter the desired quantity in the dropdown box).